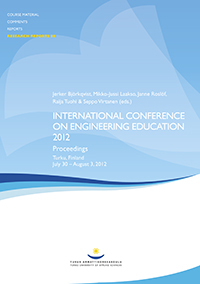 This book presents the 149 full papers presented at the International Conference on Engineering Education 2012 (ICEE 2012). ICEE 2012 took place in Turku, Finland, July 30 – August 3, 2012. The event was the 2012 edition of the popular ICEE conference series sponsored around the world by the International Network for Engineering Education and Research (iNEER) with 38 000 members in 98 countries. ICEE 2012 was hosted by Turku University of Applied Sciences together with University of Turku and Åbo Akademi University. The papers of this electronic publication are written by 356 authors representing 34 different countries. The extended abstracts of these papers have been previously made available in a separate ICEE 2012 Abstract Book in the form they were accepted during the first submission phase in February 2012. The Abstract Book has been published both as a traditional printed book and in electronic format. Click on the green "Lataa E-julkaisu" button to load the guide and the table of contents of the publication. Click on the names of the parts 1–4 to load e-books for free. This copyrighted material can be downloaded and printed for private use. Commercial use prohibited.